FILE - Lebanese soldiers listen to a briefing from an official during a media trip organized by the Lebanese army on the outskirts of Ras Baalbek, northeast Lebanon, Aug. 28, 2017. Britain announced Thursday it is stepping up support of the Lebanese army, providing funds for defensive barriers to be used along Lebanon’s border with Syria. The move is being seen as a vote of confidence by London in the Lebanese army and encouragement of the ambition of its commanders to emerge as the dominant military force on the frontier with Syria — a goal that would complicate Iran’s forging of a so-called ‘land bridge’ through Iraq and Syria and of assisting its allies in Lebanon, Hezbollah. The stepping up of aid to the Lebanese army (LAF) — Britain had already agreed to help fund over several years construction of 30 border watch towers and 20 forward operating bases — comes just days after LAF and Hezbollah, the country’s radical Shi’ite movement succeeded in clearing Islamic State fighters from a mountainous pocket of the Syria-Lebanon border. The clearance operations were simultaneous but LAF insists there was no coordination between its assault inside Lebanon and Hezbollah’s from the Syrian side, a claim dismissed this week by Israeli officials. Any evidence of liaison with Hezbollah, designated by the U.S. as a terrorist organization, would undermine LAF’s standing in Washington and Western capitals and jeopardize Western military aid for the Lebanese military. In the end Hezbollah negotiated safe passage for some 300 jihadists and their families to eastern Syria, close to the Iraqi border. The Hezbollah safe-passage deal infuriated the U.S. and Iraq, whose governments condemned the agreement, which appears to have been engineered to spoil claims of battlefield success by LAF. For years LAF has had to defer to the Shi’ite movement, in a complex dance of a relationship aimed at avoiding clashes between the two and upsetting Lebanon’s delicate and highly charged sectarian politics. Even so, some analysts say LAF should be seen as the bigger winner of the clearance operations rather than Hezbollah, as it drew the country’s military out from the shadows and allowed it to assert itself, undercutting Hezbollah’s claims that it is indispensable when it comes to Lebanon’s defense. Aram Nerguizian, a military analyst who specializes in Lebanon, noted in an interview with local media, that for the first time since Lebanon’s independence LAF is now deployed almost fully along the border with Syria. “Over the last five years, areas that have been no-go zones for the Lebanese army – because they were spheres of Syrian government and/or Hezbollah preeminence – have gradually become LAF zones of control,” he said. Last week, Israel’s envoy to the UN, Dany Danon, accused Hezbollah of planning for its next military campaign against Israel, arguing that Shi’ite commanders are “using officers in the Lebanese Army as terror operatives who help it against the IDF [Israel Defense Force] along the border,” with Israel. He claimed Hezbollah was building up its arsenals in southern Lebanon readying for a future attack and accused the UN peace-keeping force of failing to interdict the movement of arms. Western powers, though, are clear in their determination to help boost LAF. 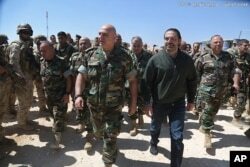 Britain’s ambassador to Lebanon offered congratulations to Aoun during a Thursday visit to LAF headquarters on the clearance operation known as “the dawn of mountains,” of IS fighters in the mountain regions of Al-Qaa and Aarsal, on Lebanon’s north-eastern border with Syria.